What makes you stop and look? As my business grows, I’m finding that the imagery and graphic design elements in my posts are WAY more important than I ever could’ve thought. It makes sense, though. In my last post I talked about the importance of an eye-catching blog title, and I would apply the same level of importance to images and graphics. Luckily, there are a lot of easy-to-use design platforms that help business owners like me who don’t have a background in graphic design. For example, Canva is a free and super user-friendly platform that I employ fairly often to create graphics and images for my posts. Even with the help of platforms like these, there is a lot to keep track of and a lot to learn. Some elements to graphic and image creation are clear-cut. Pixel size is a great example. A Facebook cover photo has to have certain dimensions for it to fit in the cover space. That image also shouldn’t have anything notable in the bottom left-hand side because that piece gets covered up by the profile photo, which also has to fit certain dimensions. Sizing is the easy part of graphic/image creation because, like I said, it’s black and white. The image either fits or it doesn’t. There is only one size that works for each image location so we don’t have to worry about having too many options. The abounding options arise when we create the actual content of the graphic, and this is where it can quickly get overwhelming. When I create a graphic or some sort of design to post, I consider 4 attributes and how I can manipulate them to better portray my content. I have a specific color scheme and a few choice fonts that I use for my business. These colors and fonts are present in my logo, my graphics, my website…anything I’m putting out to the public. I try to be consistent with color and font so that when people see them they will of think of my brand. I chose these colors/fonts for Kate Hoerner Fitness very carefully because I want them to accurately represent my brand. They are strong and bold, yet feminine and informal. I’m trying to be the friend and be the teacher, so I need to keep it light but also professional. I use lines and shapes to capture attention and draw gazes to certain areas of the graphic. The workout I posted below is an example of the benefits of a graphic, specifically with the use of lines and shapes. If I wrote this workout long-hand in a plain blog post, most people probably wouldn’t pay any attention to it. BUT, because the graphic has bright colors, lines/arrows and fun shapes, it can grab a readers attention and get them to linger just a few more seconds to find out what it is. When I create images or graphics, I like to emphasize certain words or parts of the image by using contrast as a tool. For example, when I want to share a motivational or inspirational quote, I put it into an image or graphic to help me send a stronger message. Instagram and Facebook don’t allow bold or italicized text in the caption writing, so instead I put my quotes into graphic format and this way I am able to emphasize certain words or phrases. If you scroll through my posts, especially on Instagram, you’ll see a few super simple, almost bare, pictures or text graphics. I like to use these once in awhile not only to draw attention to the text comment below the images, but also to add contrast to the patchwork of images on my main Instagram profile. For example, I used the #SOS image below on Instagram to promote a freebie guide for one of my proprietary fat loss systems. I wanted to draw clicks so people would read the caption to find out what #SOS means. If they were interested, the post would lead them to sign up for my email list (which as you guys know is always my end goal). Here’s another example of how I use space and simplicity in my images. This photo is pretty boring, but it probably makes my followers wonder what the point of it is, which means they will probably click on it just to figure out why I posted it. Images like these, where it almost seems so simple that there must be more, are great ways to get people to read captions. This post was a “teaching moment” and I used it to educate my readers on the physical and mental benefits of walking. As I said earlier, my brand is a combination of “being the friend” and “being the teacher”, so I employ this idea with my graphics and images to show things that are both personal and educational. At least one of these four elements will be at play in any image or graphic that I create. Images are incredibly powerful, especially in such a fast-moving world where people rarely stick around to read a full sentence. According to John Medina from Brain Rules, “When people hear information, they’re likely to remember only 10% of that information three days later. However, if a relevant image is paired with that same information, people retained 65% of the information three days later.” In other words, if I want people to remember my brand and business, I better have some memorable images and graphics. Now that you know the effort that comes on the back-end of marketing graphics and images, do you notice which elements best capture your attention? Wow awesome post! I loved how you used your own personal business to highlight how you apply the various graphic designs and the underlying strategies behind them. There are so many ways you can go about designing a website or motifs behind Instagram posts, but unless you have a set structure to it, you won’t gain the attraction and awareness that you are looking for. I loved your ideas behind posting simple pictures on Instagram, making people wonder why you posted it, therefore zeroing in on what the caption says. Very interesting strategy that I would personally definitely utilize at some point. Great post! I think your rules with catching attention makes a lot of sense. Even scrolling on facebook, I tend to only stop and read the things that catch my eye and it’s great to hear that your business is on top of the game. It would be interesting to see what sort of exposure rate difference there might be between the features you mention and what we would call a “boring” post. Another great, practical post. I think you’ve found your niche in this class! I really enjoyed reading this piece! I like your quote about people remembering images more than text. This is definitely true and why most brands have really simplified their digital and print ad content to emphasize a brand image either by itself or along with a short message. I like the inclusion of contrast in your list. Bright colors are definitely eye catching, but the same goal can often be accomplished with standard colors that contrast well. Awesome post! I am currently taking a digital design class at BC where I have to create logos and try to determine what differentiates good design from bad design. And it’s way more complicated and harder than I thought, so thank you for this post! I definitely agree that images, colors, fonts, and lines all help catch someone’s eye. You can have the best product or content in the world, but I agree that ads or posts won’t matter unless they are of good design. I also am a fan of simplistic design because when I see ads with too many words or colors, I usually skip over them. Finally, as video becomes more effective and accessible, especially on social media, adding these design elements to gifs or videos will make marketing even more affective. Great job with this post. A lot of this was really valuable information and hearing from your personal experience in business was awesome! 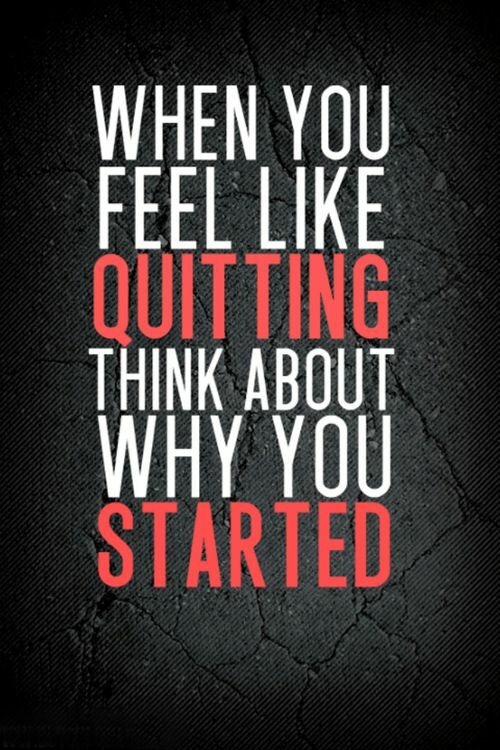 I really like the quote, “When you feel like quitting, think about why you started.” I don’t know whether or not it is the message or the contrast behind the image but I really liked it and saved it to my desktop. The point about adding relevant information to an image making it much more likely to be retained was the major key point I will take forward from your post. Thanks! Great post! I loved learning about your process for selecting images for your business. It’s certainly something that is easy to overlook but definitely makes a difference. I think I’ll spend a little more time choosing images for my blogs now!